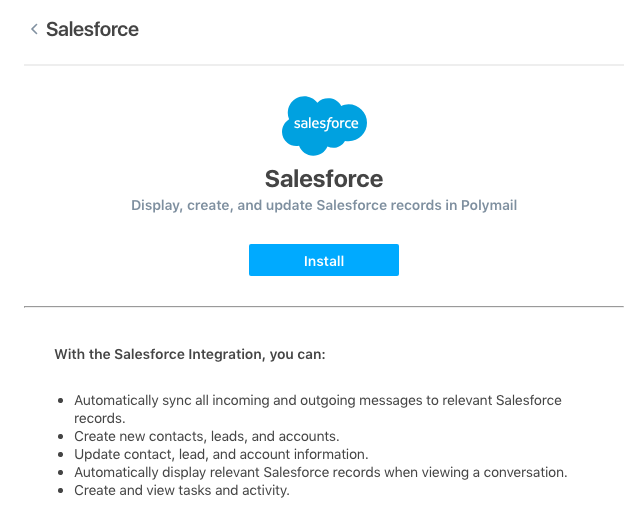 Have a Salesforce account and want to use it within Polymail? 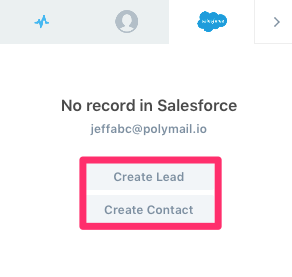 Our new integration allows you to view your existing Salesforce Contacts and Leads within our app, create new Contacts and Leads from Polymail Contact Profiles, create tasks, log activities, and sync all sent and received email to Salesforce. If you're using Salesforce on their Contact Edition, Professional Edition, or Group Edition, you won't be able to use our integration. Go to your Settings in the Polymail Web app by clicking on the small carrot in the lower left corner and then on Settings in the menu that appears. Click on the Integrations tab on the left and you'll see an "Install" button. 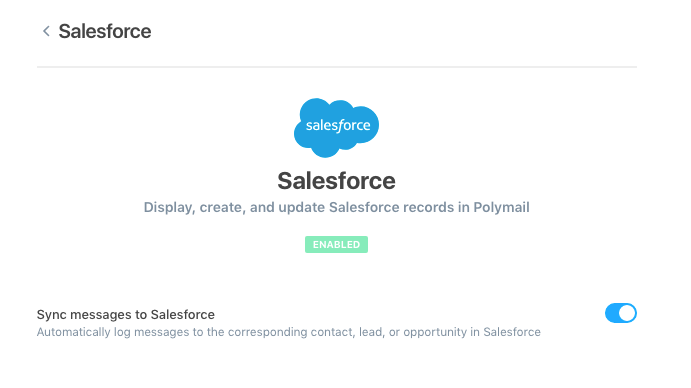 Once you've logged in, Salesforce will be enabled in Polymail. You can then choose to sync messages to Salesforce with the blue toggle. 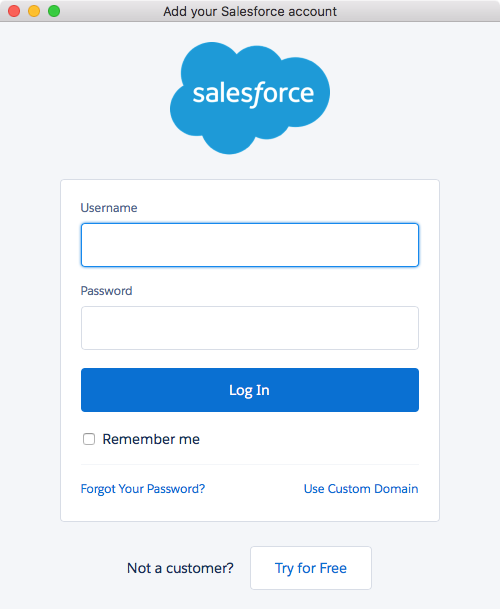 Your fellow team members will also need to connect to Salesforce to authenticate their accounts and use this integration. They can do so either by clicking the "Connect" button in the Integrations tab. Once you've authenticated your account, you'll see your Salesforce preferences appear asking you if you would like to enable Salesforce sync. 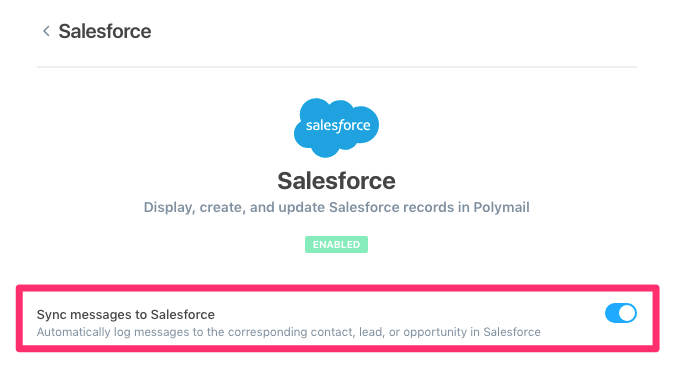 Enable this if you would like your sent and received emails from Polymail to sync back to Salesforce. 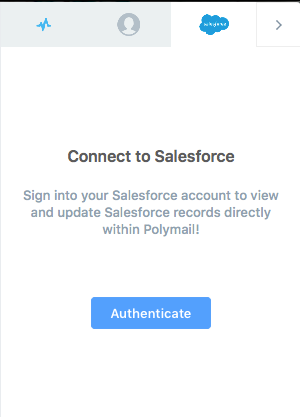 Now that you've authenticated your Salesforce account, any contacts and leads you have in Salesforce that are not yet in Polymail will sync to Polymail. 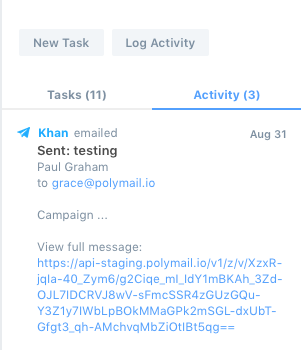 We sync Polymail with your Salesforce account twice a day. This information will sync back to Salesforce.